Limited to an Edition of 1,000. ~ Signed & Numbered by the Artist / Ready to put into a standard size frame. Nothing says early Americana better than the old community grist mill. This particular mill, now known as Kirby's Mill, in Medford, NJ was built in 1778, when our nation was in its infancy. It marked the beginning of "modern industry" with the construction of a dam, a grist mill for grinding grains and a saw mill for cutting lumber into planks. By the turn of the century, a carding house which prepared fibers such as wool and cotton for spinning was added. Later a blacksmith shop for iron work and horse shoeing was included. About the same time, a wheelwright for repair of wheels on wagons, carriages and other equipment was also operating at the mill complex. The grist mill was just the start of a whole center of industry! At its height, other businesses, such as a cider mill, a still house and a shingling mill were all booming by the grist mill's side. Now the machinery has long been silent and the jobs the artisans once did are done by factory workers in big cities around the globe. The old grist mill is the symbol of a much different era. A time when our way of life and our awareness of the world were much different than they are today.
" 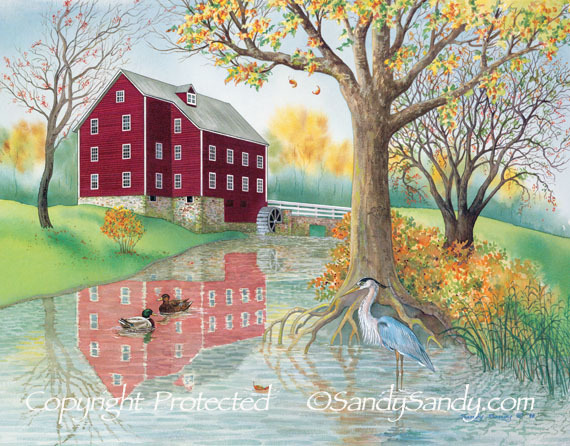 have chosen to portray the mill accentuating the water with the reflection in it. Water symbolizes other dimensions on earth, creative energy and dream time. Water will take the shape of its container and thus can teach us to adapt to outside influences. The Great Blue Heron is a lone hunter whose quick aggressive technique is its message. Take decisive action as opportunity arises! The Mallards remind us to drink from the waters of life as we maneuver through its ever changing path. The ducks seem to say to go with the flow, with grace and comfort.